Battlecruiser 3000AD is a science fiction video game, noted for its long, troubled development history. The game takes place in the year 3000 AD, centuries after mankind has developed advanced spacecraft, and discovered new worlds and intelligent life-forms within and beyond the Solar system. However, space travel is described as restricted to military personnel and scientists despite its conveniences. The story goes on to describe an interplanetary war, started in 2041AD, with Earth involved. In 2044AD, Galactic Command (GALCOM) is formed to maintain law and order amongst planets. The Gammulan race opposes the alliance and war is waged between GALCOM and Gammulans. The player takes the role of a recruit assigned to defend the GALCOM consortium of planets against Gammulans. The events of the game begin with GALCOM diplomatic craft developing a navigational malfunction and straying into Gammulan territory. GALCOM supreme commander Stranix reports a Sphinx class battlecruiser intentionally destroyed by Gammulan orbital defence system, with no survivors; meanwhile, a team of Renegade class interceptors ambushes a Gammulan starfighter in GALCOM space. Free Flight: Player freely cruises the galaxy and learns the large array of controls and computer interfaces without fear of attack by alien craft or pirates. Advanced Campaign Mode: In this mode the game is dynamic, and changes can occur rapidly and often through political and military influences. Xtreme Carnage Combat Simulator: It is a combat simulator that allows the player to gain experience in combat operations, both planetbound and in free flight. Derek Smart began his game development career in the late 1980s, with a vision of creating an all-encompassing space simulation game, featuring strategy elements along with space, planetary, air and ground combat. Smart became a notable personality in the videogame world during the early 1990s, even before releasing his software debut. Smart became known to the then-nascent online gaming world through discussions taking place on Usenet about the game, his development efforts, and many other topics. The game first appeared on the cover of Strategy Plus in 1992. Shortly afterwards, Three-Sixty Pacific obtained the rights. It held the rights for a year and went out of business shortly afterwards. 3000AD, Inc then signed the rights with Mission Studios. Mission Studios also signed distribution deal with Interplay Productions for its products. The game was showcased in 1994 winter and 1994 summer CES under the Interplay Affiliated label brand. However, due to financial constraints, an agreement was reached which allowed 3000AD, Inc. to seek a new publisher. Intracorp bid for the rights to publish the game; with a disagreement over source code release, the deal never progressed beyond a letter of intent. The game appeared in 1995 E3, then Intracorp went bankrupt shortly afterwards. Take-Two Interactive bought the publish right to the game from Mission Studios in 1995, and released v1.00 of the game, with GameTek (UK) published the game in 1997. In Take-Two Interactive's SEC filings on February 10, 1997, the company stated that Battlecruiser 3000AD accounted for 14.2% of revenue for the fiscal year ending October 31, 1996. The filing also stated that Take-Two Interactive "made advances in the aggregate amount of approximately $618,000" for the title. Development of version 2.0 of the game continued throughout 1998, and Interplay announced that it would publish an improved version (dubbed Battlecruiser 3000AD v2.0) through its Value Product Division. Unlike the previous product, only a Windows version was supported. 3D acceleration is supported only through 3dfx hardware. The game now contains 13 alien races, 25 castes. Game map contains 25 star systems with 75 planets and 145 moons in total. From 1998 to 2001, Smart developed his next game in the Battlecruiser franchise, Battlecruiser Millennium. The game was to be exclusively distributed at Electronics Boutique locations and was self-published by his company 3000AD, Inc. The deal made with EB was a first of its kind merchant exclusivity deal for a game's release, with an independent developer paying for all materials to publish the game for distribution through the retailer. When asked by the gaming media about his thoughts on the deal, Smart stated "I'm paying for everything. I bear all the risk. I pay for the cost of goods, including the boxes and manuals." After its retail run, Smart released Battlecruiser Millennium on the Internet for free as he had done with his previous titles. He has mentioned that he intends to keep up this practice of releasing his products for free once their "shelf life" has expired. It is a version of Battlecruiser Millennium with complete updates. A client-server multiplayer engine is introduced in this version. Flight controls can now be done using mouse. One new small sized galaxy containing 12 space regions, 12 planetary regions, 272 planetary mission zones and 1,086 planetary areas of interest (scenes). This galaxy does not include map. All the new scenarios included in this game take place in this new galaxy. The full map now includes 152 space regions containing 238 planets, 4033 planetary mission zones, 21548 planetary areas of interest in total. 44 planetary starbases, 1,011 military bases and 13 star stations. The full map now includes 96 starbases, 14,408 military bases and 71 star stations in total. 20 new Instant Action scenarios with a variety of missions ranging from easy to extremely hard, which brings the total number of Instant Action scenarios to 45. One new ACM scenario (Broken Arrow?) with multi-branch scenarios which can either end up being 11 or 15 missions depending on resolution of certain missions. In the GameStop exclusive version of the game, there is yet another ACM scenario. The total number of ACM scenarios is five depending on version. The developer originally intended to introduce multiplayer feature when making the original Battlecruiser Millennium back in late 1999, but due to unforeseen circumstances, this feature was dropped in the initial product. The product was to use the RTIME Interactive Networking Engine. When the game was redesigned, the developer discovered that the original design architecture of the game kernel prevented the implementation of multiplayer, so the game was redesigned. Further information about it was revealed in the Smart Speak section of the manual. Battlecruiser Commander - It is the working title for the sequel of Battlecruiser 3000AD. Battlecruiser 3020AD - It is the working title for the sequel of Battlecruiser 3000AD, to be released after Battlecruiser Millennium. The game would include online multiplayer universe, first person in-ship mode. BC3K: Strike Pak - This game allows player to board, in first person perspective, ships targeted by player. It was designed to be a standalone game or be linked to Battlecruiser Commander. BC3K: Skirmish Pak - This was intended to be a multiplayer addon to the Battlecruiser Commander, but multiplayer feature had never been implemented until Battlecruiser Millennium Gold. Battlecruiser Tactical Engagement - It is an in-ship first person perspective add-on module for Battlecruiser Millennium. That project was replaced by "Project ABC," for "After Battlecruiser," which later became Universal Combat. A prototype for the add-on was produced. Battlecruiser Online - It is massively multiplayer online version of Battlecruiser Generations (later called Universal Combat), with off-line single-player training component. However, neither Battlecruiser Online nor Universal Combat series have included games that feature persistent online worlds. Before publisher Take-Two Interactive released Battlecruiser 3000AD in September 1996, it had generated one of the longest and largest flame wars in the history of Usenet. This flamewar lasted for several years, garnered over 70,000 posts, and yielded a series of sites that documented and parodied its history. Smart and Take-Two Interactive advertised that Battlecruiser 3000AD used a neural network to perform artificial intelligence tasks in the game. However, this claim has been criticised as highly improbable by other games designers. In one article in a computer games magazine, Keith Zabalaoui, former NASA programmer and one of the designers of the Close Combat series of strategy games, was quoted as saying, "I have a hard time believing it's in there... the concept of training [neural nets] to do the complex tasks required in a game is inconceivable. It's mumbo jumbo. I guarantee you that if there's a neural net that does anything in [BC3K] this man would be in the Computer Science Hall of fame." Upon its initial release of Battlecruiser 3000AD, the game contained many bugs that made it unstable, according to a GameSpy.com reviewer, who asserted that "Smart consistently overrates his own products and his own abilities." For his part, Derek Smart claimed that the buggy release was the responsibility of Take-Two Interactive. After the initial release, Smart issued several patches and upgrades for the product over the next few months, and eventually a final patch was released to fix some of the major bugs. In February 1998, after obtaining publishing rights from Take-Two Interactive, Smart released the game on the Internet for download free of charge. Derek Smart filed a lawsuit against Take-Two Interactive (who also released the game in the UK through a sub-license deal with GameTek) for alleging breach of contract. The lawsuit was later settled out of court, and both parties released statements of resolution in late 1998. Smart regained the rights to the game via the settlement. He continued to develop a new version through his personal company, 3000 AD. Gametek promoted the game in the UK with a notorious print ad featuring model Joanne Guest wearing lingerie and straddling a copy of the game. THQ later ran a parody of the ad, featuring a fully dressed, matronly woman mimicking Guest's pose (down to her chewing on the same finger) and Battlecruiser 3000AD replaced by a sign with the THQ logo. Battlecruiser 3000AD was covered extensively in gaming magazines during the development process, including a 1992 cover story in Computer Games Strategy Plus. The game was marketed as "The last thing you'll ever desire" in pre-release ads that ran in computer gaming magazines. 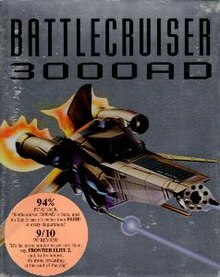 Battlecruiser 3000AD was released against the wishes of its main designer, Derek Smart, as it was still incomplete and buggy. Gamespot gave it a score of 2.6/10, writing that "it will go down in legend as the most bug-ridden, unstable, unplayable pieces of software ever released." Battlecruiser Millennium was better received, with scores of 65% and 68% at aggregate review sites GameRankings and Metacritic respectively. According to some reviews of the game, it was as encompassing and strategically pleasing as the developer had set out to make, but lacked in user interface design friendliness and atmosphere. In 2003 Gamespy named it the 19th most overrated game of all time due to the hype Derek produced with his extremely ambitious game play promises that he would ultimately be unable to fulfill. ^ a b "Battlecruiser series". Retrieved 2006-10-21. ^ "Battlecrusier 3000 A.D." www.gamesfirst.com. Retrieved 4 December 2017. ^ a b c d "loonygames' Guest Editorial: Derek Smart". Retrieved 2006-12-05. ^ a b c "Take2 SEC 1998 10KSB Filing". 1998-02-06. ^ "Press Release: Interplay Value Products Division to distribute Battlecruiser 3000AD v2.0". Interplay. 1998-08-05. Archived from the original on 2000-08-18. ^ "IGN: EB Signs Pact with Derek Smart". Retrieved 2006-12-06. ^ "GameSpy.com — GameSpin: Volume 2 -- Battlecruiser Millennium, Tropico and Anarchy Online". Archived from the original on 2006-05-07. Retrieved 2006-12-06. ^ "AusGamers.com — Australia's Games Community: Battlecruiser Millennium Now Freeware". Retrieved 2006-10-21. ^ Staff, I. G. N. (12 March 1999). "Battlecruiser 3020 AD Gets Support From RTIME". ign.com. Retrieved 4 December 2017. ^ "Battlecruiser Millennium Gold product info" (PDF). 3000ad.com. Retrieved 4 December 2017. ^ "3000AD - 3000AD Website". 3000AD. Archived from the original on 2008-11-20. Retrieved 4 December 2017. ^ Parker, Sam (7 August 2000). "Battlecruiser Team Takes on Serious Sam Engine". gamespot.com. Retrieved 4 December 2017. ^ "Battlecruiser Tactical Engagement Info". fileplanet.com. Archived from the original on 2012-02-25. Retrieved 4 December 2017. ^ "The Saga of Battlecruiser 3000". The 25 dumbest moments in gaming. GameSpy. Archived from the original on 3 July 2006. Retrieved 2006-07-11. ^ T Liam Mcdonald (March 1997). "The Neural Net that Wasn't". Boot Magazine: 27. ^ "Get in the Game: Battlecruiser Millennium". Retrieved 2006-12-05. ^ "Battlecruiser 3000 A.D. for PC Review — PC Battlecruiser 3000 A.D. Review". Retrieved 2006-10-20. ^ a b c "GameSpy.com — Article: The 25 Dumbest Moments in Gaming". Archived from the original on 9 November 2006. Retrieved 2006-10-20. ^ "Battlecruiser 3000 A.D. Set Free — News at GameSpot". Retrieved 2006-12-05. ^ "Smart, Take-Two Settle differences — News at GameSpot". Retrieved 2006-10-21. ^ "Videogames Continue to Shock the System". Next Generation. No. 27. Imagine Media. March 1997. p. 19. ^ Bub, Andrew S. (2003-04-19). "Derek Smart on Battlecruiser Generations & Beyond". Archived from the original on 20 August 2006. Retrieved 2006-07-11. ^ McDonald, Tim (17 December 1996). "Battlecruiser 3000 A.D. Review". gamespot.com. Retrieved 4 December 2017. ^ "Battlecruiser Millennium Reviews". Retrieved 2006-12-06. ^ "Battlecruiser Millennium (PC: 2001): Reviews". Retrieved 2006-12-05. ^ "Battlecruiser Millennium — It's much improved over the previous release but it still asks for too much from the player". Archived from the original on 5 December 2006. Retrieved 2006-12-05. ^ "Top 25 Most Overrated Games of All Time". Gamespy.com. Archived from the original on 18 February 2004. "Dreamcatcher Battlecruiser Millennium Gold website". Archived from the original on 2007-11-16. Retrieved 2007-11-16. This page was last edited on 7 January 2019, at 10:36 (UTC).